I've been making my own laundry detergent for about six months now. Although it works great I was looking for an alternative that would be cheap, effective, and safe for the environment as well as my family. I ran across Allens Naturally while looking for cloth diaper detergents and was tickled pink when they agreed to let me try it & give one away. Because I don't want to find out someone has an allergy in such a sensitive area, I try out new detergents on our clothing before doing a load of fluff. 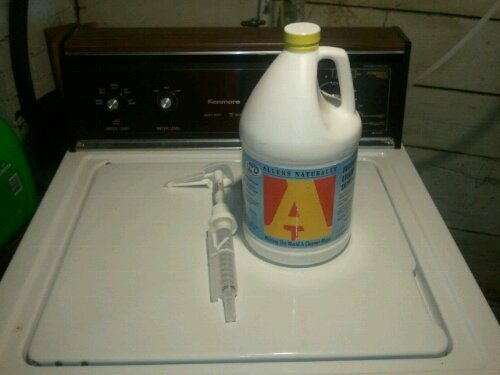 Allens Naturally has now replaced my homemade laundry soap! Its much easier to just push the pump down and have the exact amount than make, measure, mix, and pour my own. Our clothes come out clean and its even better for us than the recipe I used last time. “Allens Naturally was born about 30 years ago in cooperation with a Store Front Cooperative named Stone Soup (which has since closed), whose members wanted home care products free of dyes, perfumes, and fragrances. Many of the members were involved in the Feingold diet. Dr. Feingold’s theory was that children were hyperkinetic because of the dyes in food. It was the belief of the co-op members that the dyes in national brands of laundry detergent might leave a residue that could possibly migrate through the skin into the body. Other members had MCS (Multiple Chemical Sensitivities) and believed perfumes or fragrances to be a major culprit. 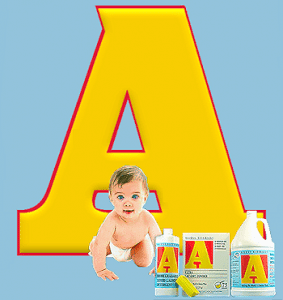 Allens Naturally also carries some other great products I'm looking forward to trying, including a Fruit & Veggie Wash, Fabric Softener, Dish Soap, and more! Check out Allens Naturally‘s great products for yourself! One lucky reader will win a “Green Baby” pack that includes a GALLON of Allens Naturally with the pre-measured pump! Head over to my 25 Crazy Dayz of Giveawayz to enter! Excellent for cloth diapers! No fragrance, super sensitive and a tiny little bit goes a LONG way. Highly recommend switching to Allens!